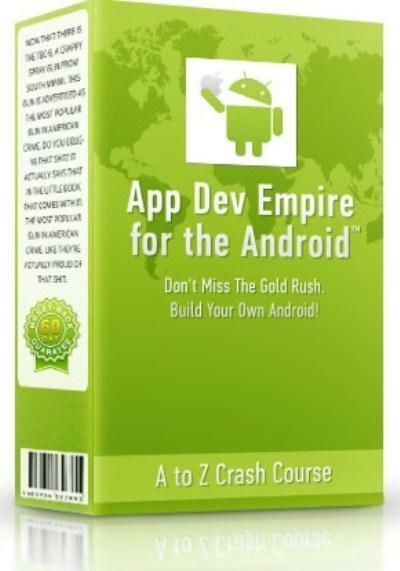 App Dev Empire for the Android: Build Your Own Android Empire With No Programming Skills | Free eBooks Download - EBOOKEE! Posted on 2013-05-30, by nobihai. App Dev Empire for the Android: Build Your Own Android Empire With No Programming Skills English | 2013 | MP4 | eLearning | 2.85GB Google Android app developers earned $125 Million in mobile display adds while iphone guys earned less than 90 last year! Google is all about PPC and advertising, that's where the biggest revenues come! You don't really have to sell your app! It can be free to download and still bring thousands! In Lesson 1 we'll download and install the development environment together, I will show you how to get around fast, the tools you really need to start fast! It's very easy even if you don't have any programming skills at all!These are actual video tutorials where you will be looking over my shoulder and duplicating my success! Next we'll get into creating your first project. You discover how to create a user interface for your first game. We will be creating your own "Scroll shooter" genre game! Just like iCopter, jetpack joyride or R-Type popular games. A simple to create game that still shows all the types of development you would need to create other games! On the next step you will discover how to create the core of the game, how to connect actions in the game, and how to add ascrolling background. In the next lesson we'll create the main player, teach him how to behave in the game and use the player's controls, how to avoid obstacles. We'll also add some cool animations, such as explosions! Next we explain how to check the interactions with the objects and teach our player to avoid the obstacles, adding more cool animations along the way. Next we'll add game bonuses to keep the player motivated. Finally we'll set the conditions of game victory and defeat, and add some cool music and visuals. In the final video tutorial we'll show you how to export the finished game into the Android marketplace, called GooglePlay, submit, and start making sales! In conclusion, you will have a full plug and play solution that you can be selling in the marketplace right away! And remember there is no approval or risk that your game will be declined! That's the beauty of developing for Android ! No comments for "App Dev Empire for the Android: Build Your Own Android Empire With No Programming Skills".